Well, The Hunger Games saga has come to an end. An unspectacular, anti-climatic, unsatisfactory end. I had some hope Mockingjay Part 2 would end the series in good fashion after finding Part 1 to be utterly bad and unnecessary and while the conclusion technically is better, it’s not by much. 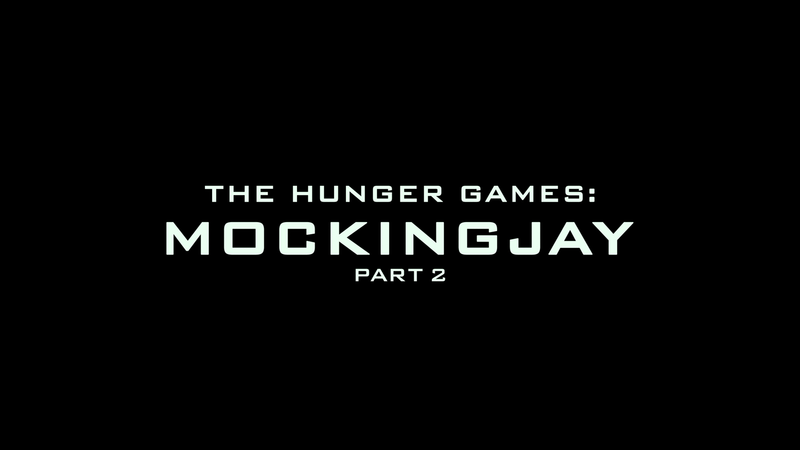 The film basically opens where Part 1 ended: Katniss (JENNIFER LAWRENCE) has just been savagely attacked by friend/love interest Peeta (JOSH HUTCHERSON) after having been brainwashed while in captivity by President Snow (DONALD SUTHERLAND). Eventually the bruises heal and she regains her voice but the damage is done. 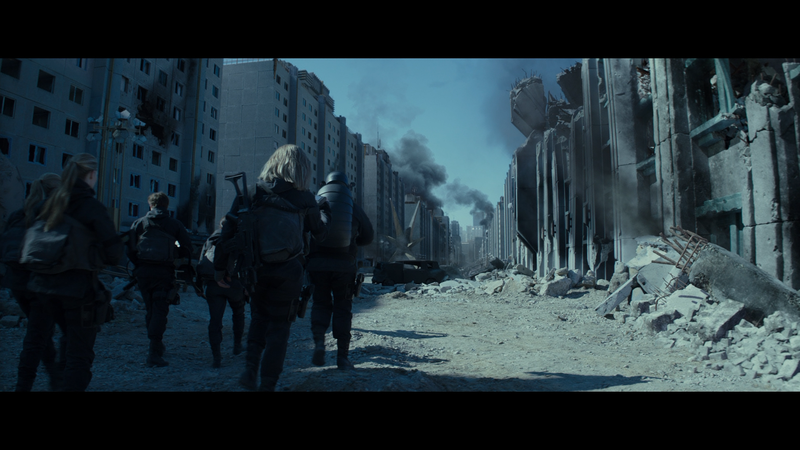 The rebellions, under the leadership of President Coin (JULIANNE MOORE) have won major victories but before they advance upon the Capitol they must lay waste, and take the arms, in District 2. It’s a brief sequence that begins with barraging the District’s underground compound, closing all exits but one, for civilians to escape through, but they are more loyal to Snow and one even takes a couple shots at Katniss, who was merely there as propaganda, but of course she manages to survive with a couple nicks and bruised ribs; it serves as a short-lived propa victory for Snow. Having enough with the fight, Katniss vows to assassinate Snow and in spite of Coin shutting the idea down, she sneaks onto a carrier to serve on the front lines with the other troops, including her other love interest, Gale (LIAM HEMSWORTH), who are planning an assault on the Capitol. With two groups of soldiers, they must travel hundreds of blocks, abandoned by Snow in order to lay a trap, laid with mines with gruesome results if triggered, though they are equipped with a device to locate them. 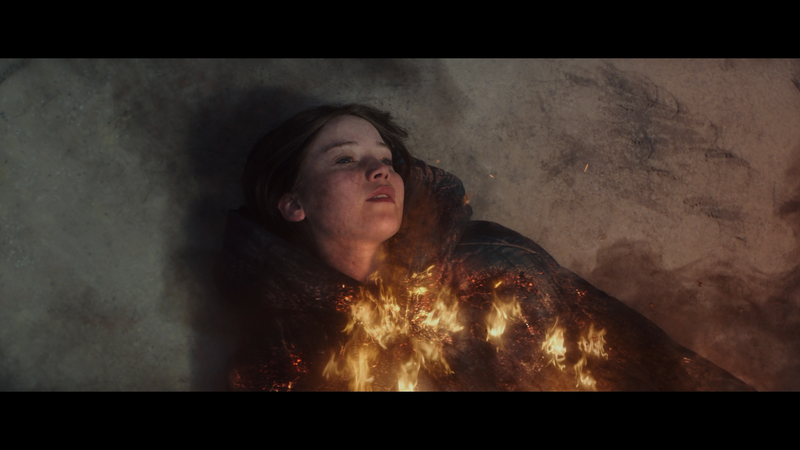 The remainder of the film finds the unit avoiding traps and for good dramatic measure, Coin has placed the psychologically damaged Peeta who can’t discern fantasy with reality and even attempts to kill Katniss though at other moments the old love triangle between Katniss, Peeta and Gale crops up. Basically it’s the other half of one story, that could’ve easily been made into one two and a half hour movie, and Katniss’ determination to kill Snow however it’s not all black and white as Coin has her own motivations in a new world order. The Hunger Games saga hasn’t been the best yet amongst the other young adult adaptations, including clones such as The Divergent Series and The Maze Runner, not to mention Twilight, it’s probably top-of-the-line both in terms of production values but performances. If there was one consistency between the four movies, it’s the performance from Jennifer Lawrence who has wonderful on-screen chemistry and makes one care about her Katniss character. The others, like Liam Hemsworth and Josh Hutcherson hold their own well enough while Julianne Moore, Donald Sutherland and the late Philip Seymour Hoffman bring the right amount of weight for their respective characters, albeit with Hoffman his presence was missing on several occasions though the filmmakers seemed to have done a nice job filling the gaps. 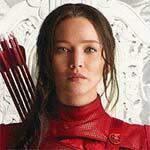 The film was once again helmed by Francis Lawrence who handled the last three Games movies. His style seemed to work well with the bleak future world given he also directed I Am Legend and while it’s nothing noteworthy or incredible, Lawrence did seem to get the best out of the cast in spite of issues with the script — written by Peter Craig (The Town) and Danny Strong (The Butler) from author Suzanne Collins’s own adaptation of her novel — not to mention unnecessarily splitting the last chapter into two movies. This release comes with a semi-glossy slip cover. Inside is a redemption code for the Digital HD copy and a DVD Copy. Audio Commentary – Director Francis Lawrence and Producer Nina Jacobson break down the film from the splitting of the story to certain elements of production, set and costume designs. Having two participants, it keeps the track lively. 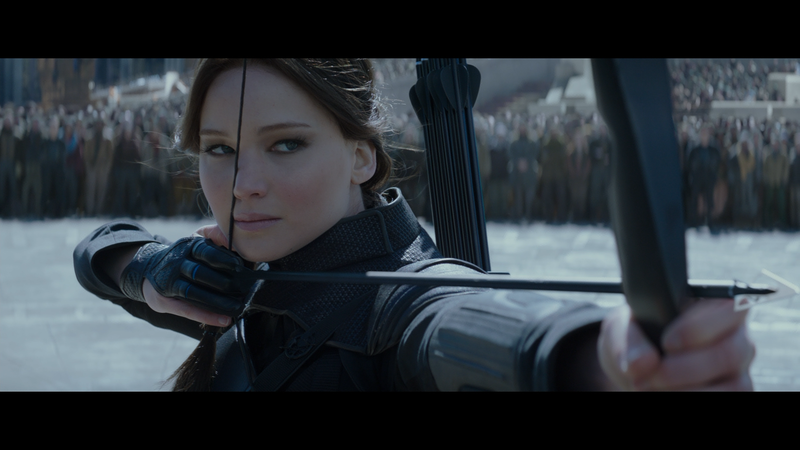 Pawns No More: Making The Hunger Games: Mockingjay Part 2 (2:21:45; HD) is an extensive, 8-part, making-of featurette documenting just about every aspect of the film from characters, plot and just an all around overview of the series. Includes interviews with members of the cast and crew. The Hunger Games: A Photographic Journey (10:17; HD) – This is a featurette on the career of on-set photographer Murray Close that began working with Kubrick on The Shining and then his work on the series. Cinna’s Sketchbook: Secrets of the Mockingjay Armor (9:22; HD) delves into the sketch designs shown in the series done through the eyes of the Cinna character. Panem on Display: The Hunger Games: The Exhibition (1:57; HD) is a short promo on the exhibition showcasing the sets, costumes and interactive games for visitors. Jet to the Set (41:58; HD) – This is an episode where the hostesses visit the locations on The Hunger Games. 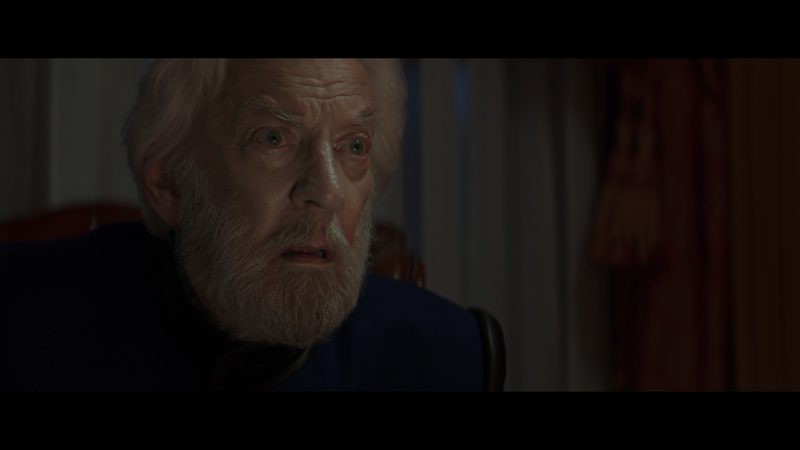 Lionsgate brings to The Hunger Games: Mockingjay Part 2 on Blu-ray presented in its original 2.40 widescreen and a 1080p high-definition transfer (MPEG-4 AVC codec). The picture quality is utterly fantastic through and through. While colors are intentionally muted in keeping with the dipodic future, there are still flashes especially with the explosions and in some of the scenes inside the Capitol; skin tones are equally toned down. Even so, detail is fantastic and there were no noticeable artifacts, aliasing or other flaws. The disc comes with a strong and robust Dolby Atmos track (TrueHD 7.1 for those systems unable to decode) that offers crisp and clean dialogue levels but also showcases the action setpieces which makes use of each and every channel. The LFE channel kicks in and thankfully it’s not overbearing but instead even-handed in distribution for those aforementioned action sequences (on some discs, the LFE can be overbearing). Even more so than the video, as it’s de-saturated of color, this is reference quality work. 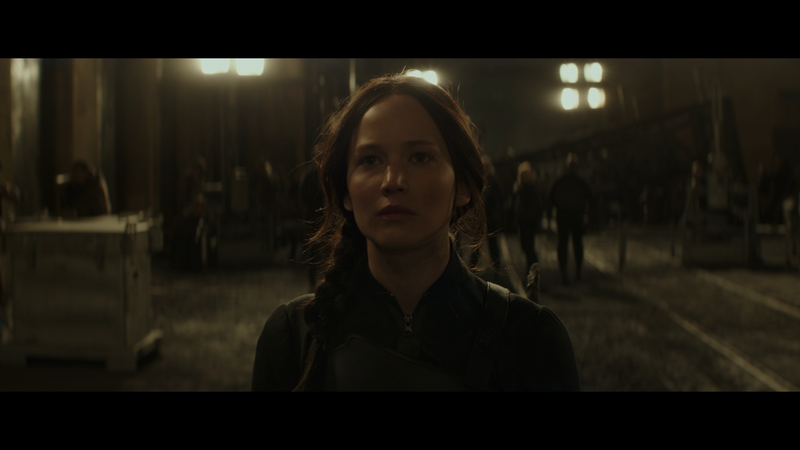 Overall, The Hunger Games: Mockingjay Part 2 is a letdown mostly because it shows why the final chapter didn’t need to be split into two with extraneous scenes that weren’t necessary in telling the story. On the plus side, the performances for the most part were strong especially from Jennifer Lawrence and the production design, as it was with Catching Fire and Mockingjay Part 1, was impressive, it’s unfortunate the screenplay/adaptation wasn’t any better. 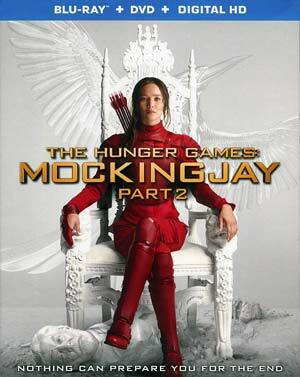 The Blu-ray released by Lionsgate is, movie aside, fantastic. The video and audio transfers were excellent and it had some of the best bonus material I’ve come across in quite some time.